Daniel Tiger’s Neighborhood LIVE Tickets Contest – Enter to 4 tickets to see Daniel Tiger live at the Fox Theatre on Saturday, April 27 courtesy of Oakland County Moms and our friends at 313Presents. 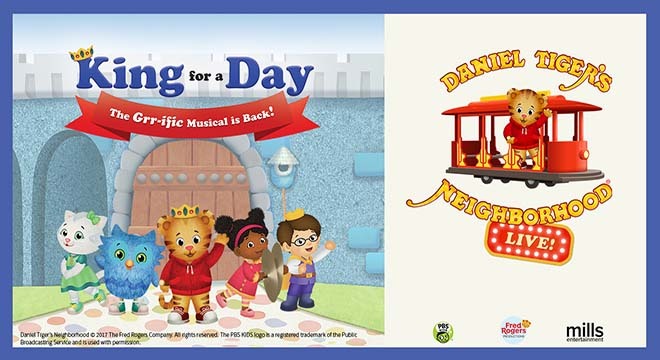 Daniel Tiger’s Neighborhood is coming to Detroit for 2 performances at the Fox Theatre for 2 fun-filled performances at 2p & 5:30p. Daniel Tiger’s Neighborhood LIVE Tickets DISCOUNT CODE – Save $5 with code SAVE5 to see the hit Emmy-nominated PBS KIDS series Daniel Tiger’s Neighborhood LIVE! King For a Day on April 27 at the Fox Theatre. Tickets are on sale now at THIS LINK. Click now and enter your code for the discount! e-mail me at lisa@oaklandcountymoms.com. Put DANIEL TIGER in the subject line and don’t forget to include ALL of your contact info (name/e-mail/phone #). Please let me know if you’ve completed steps 1-3. I’ll accept entries through Thursday, April 18, 2019 and random draw/notify a winner on Friday, April 19, 2019. The winner will receive 4 tickets to see Daniel Tiger’s Neighborhood LIVE! King For A Day at the Fox Theatre for the 2p performance on Saturday, April 27, 2019. Winner will be announced on this page on Friday, April 19, 2019. Tickets can be purchased at the Little Caesars Arena XFINITY box office, at 313presents.com and Ticketmaster.com. Discounts available for groups of 10 or more. Ticket Sales Executives are available Monday – Friday from 9a-5:30 p. For more information on group sales, call 313-471-3099.